Gross Area: 48,290 sq. ft.
Area Per Student: 25.9 sq. ft.
From a formal perspective, I really like the program. I am intrigued by how they collected the spaces. The material selection is very good as well. They’ve created a nice theme. You really get a nice sense of space, included nice opportunities for “grabbed space.” It’s very clean. The subtle colors and sophisticated palette draw you through. Bryant University has a 153-year tradition of innovation – anticipating and adapting to changes in the world to prepare students for success. 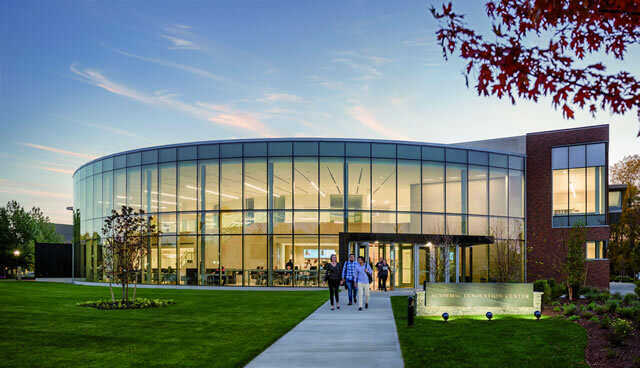 Bryant’s Academic Innovation Center (AIC) is the pinnacle achievement in a 20-year period of unprecedented growth, innovation, and transformation at Bryant University. 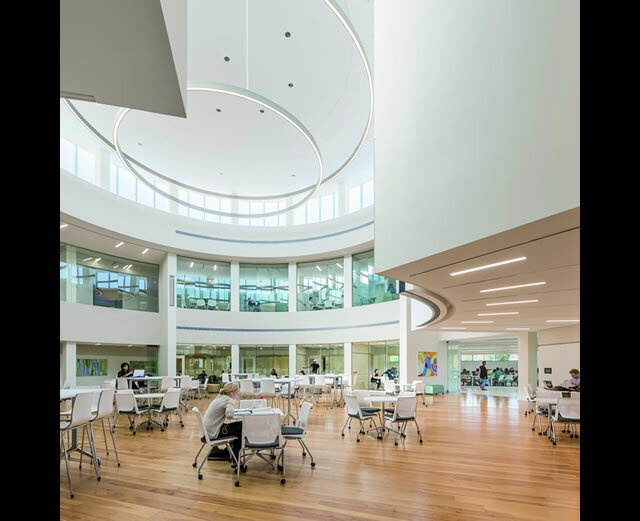 It is the result of an intensive development and design process to create a vibrant learning laboratory that removes traditional physical and intellectual boundaries to teaching and learning. With the world becoming more interconnected and technology changing the way we live and do business, Bryant understands that institutions of higher education must develop education models and modalities that will prepare students to lead and add value in the marketplace and in society. The AIC is a catalyst for manifesting Bryant’s larger, long-term vision to reimagine and redefine higher education to effectively prepare students to become innovative leaders for the future. “Environment shapes behavior, so when you change the environment, things change. 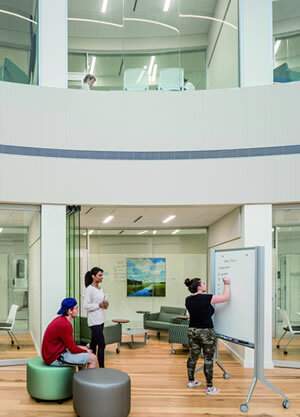 The AIC is a state-of-the art facility that provides an active, immersive, and collaborative learning environment supporting all academic programs at Bryant University. The new 48,290 sq. 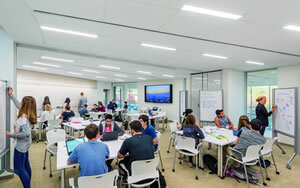 ft. building is organized around the Innovation Forum, a highly flexible space whose furnishings and whiteboards can be reconfigured to support various collaborative group learning activities. 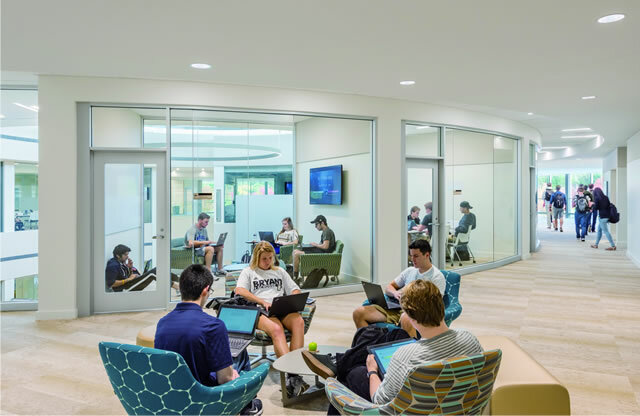 The building also includes tiered classrooms, flat-floor flexible classrooms, and breakout spaces to accommodate multimodal presentations and learning. Prominently sited at the campus’s main point of arrival, the AIC will welcome visitors and serve as the launching point for Admissions tours. A café located near the building’s main entrance and adjacent to the President’s Walkway, the campus’s central pedestrian circulation path, will draw students and faculty to the AIC, further enhancing the strong synergies among the Bryant community. Enables continuous innovation in what we teach and how we teach to create an optimal environment for learning. Removes the intellectual and physical boundaries to teaching and learning. Allows educators the freedom to develop the most effective ways of teaching and learning beyond traditional pedagogies and expectations. Builds critical thinking skills within and across disciplines to prepare students to create value in their communities and an increasingly interconnected global marketplace. 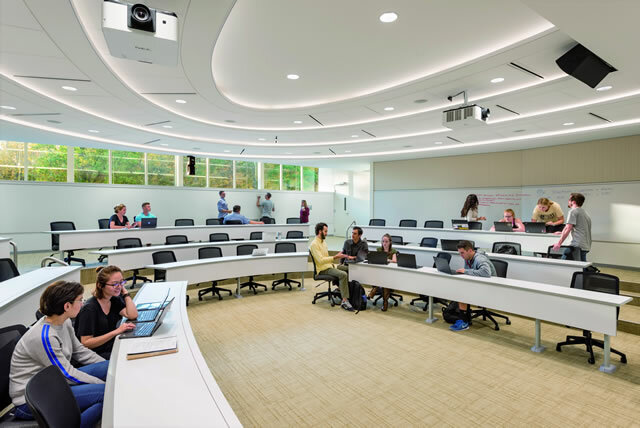 Since the Academic Innovation Center opened for the first day of fall semester classes on September 6, 2016, Bryant University has been closely monitoring its performance against the design hypotheses. 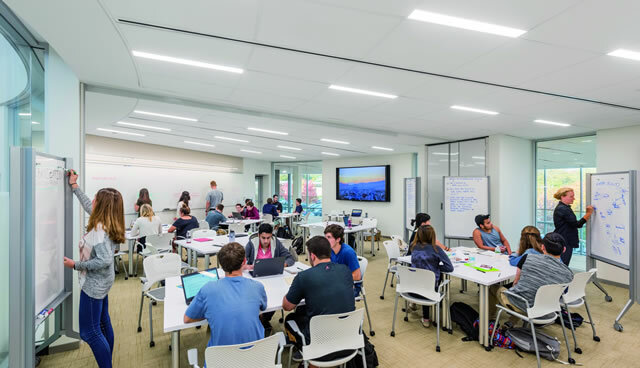 Bryant's Director of Faculty Development and Innovation ensures that the building effectively supports active and innovative student learning. Bryant University’s clear, compelling vision for the project served as a compass throughout the Academic Innovation Center’s design. 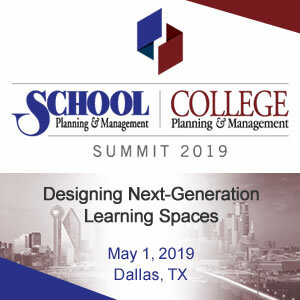 Prior to design and building, Bryant conducted significant exploration and benchmarking visits to the country’s top institutions of higher education and industry to gain knowledge and data on the latest innovations in designing educational, working spaces. Bryant completed two prototypes on campus, the Ideation Lab and Bello 102, which allowed faculty and students to test the mobile furniture and latest audiovisual capabilities that would be used in the AIC. 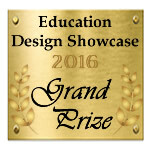 This research and these experiences informed and enriched the development of the Academic Innovation Center’s design with lessons learned and best practices. 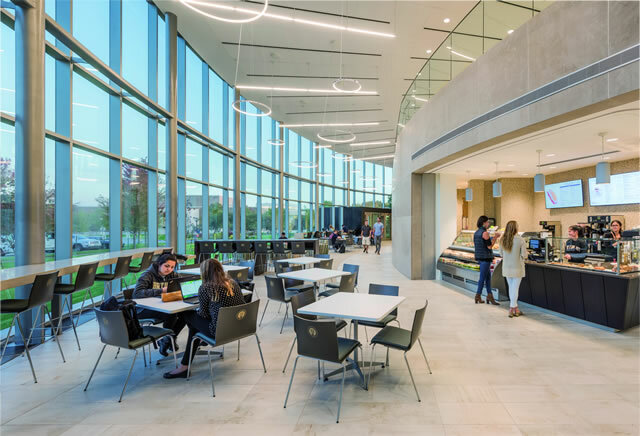 One of the challenging aspects of this project was developing an academic building that would successfully serve all academic program needs at Bryant University. At the outset of the project, Bryant University established a Faculty Building Committee, comprised of members of diverse academic programs. This committee met regularly with the architect, project team and other stakeholders on campus to articulate their desires and aspirations for this trailblazing new building. 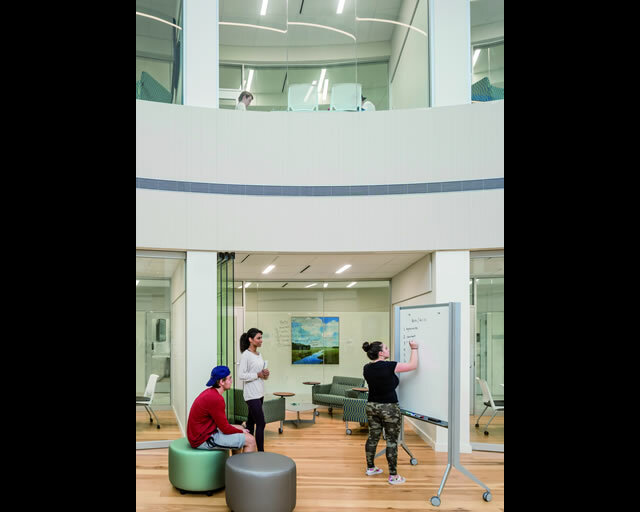 The involvement and collaboration of this committee proved vital to the creation of building that fostered innovation and active learning for all programs at Bryant University. 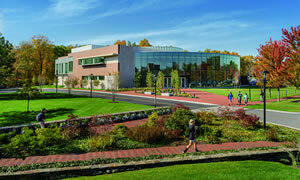 It was also critical that the building fit into the fabric of Bryant’s campus. 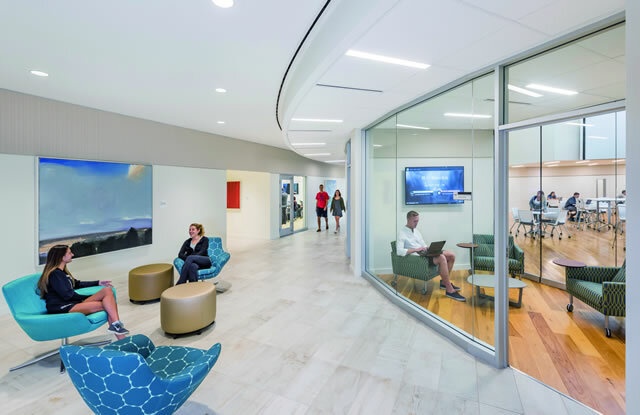 Adding to the complexity of the project, there was also concurrent design and construction of an addition to the Chace Wellness and Athletic Center project near the AIC site. To address these challenges, meticulous attention-to-detail was required during design, procurement and construction phases. Exterior materials, including precast concrete panels, bricks, mortar and glazing, were carefully coordinated between the projects and with other existing buildings on campus, such as the nearby George E. Bello Center for Information and Technology. Also, to enhance the AIC’s cohesiveness with the campus, landscape and roadway alignment changes were made that simultaneously enhance the sense arrival to the Bryant campus and showcase this new flagship building. 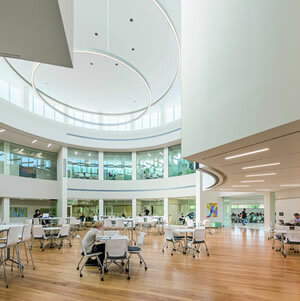 The extensive preparation for this project and collaborative design approach resulted in a unique and highly innovative academic building that leverages best practices across higher and industry. The building superbly incorporates the diverse approaches to learning advocated by the Faculty Building Committee. The AIC’s design was deliberately tailored to meet a wide range of teaching approaches, which is clearly evident throughout the building. For example, it includes a combination of large flat classrooms and tiered classrooms. One of the large classrooms can be divided into two spaces. In addition, some of the tiered classrooms have blackboards on the front three-part learning walls, while others include whiteboards. Furthermore, the audiovisual configuration differs among large classrooms and breakout rooms, offering a full range of technology and white board space. These are just a few of numerous examples of how the direct faculty and staff input helped to realize Bryant’s vision to create a world-class learning environment for its students and faculty. From the onset of the project, Bryant made clear that safety is paramount. Strict safety requirements were embedded in the Construction Manager (CM) Request-for-Proposal package. The CM safety record, program and processes were an important part of the selection criteria. Weekly safety meetings were held with all trades involved. 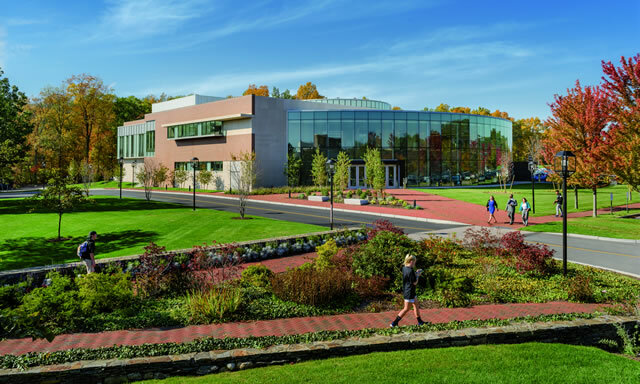 In addition, as construction of the AIC was part of a “Bryant Builds” construction surge that would add 250,000 square feet of new academic and athletic facilities to the campus, the project team actively ensured open communications and coordination among projects. Energy saving HVAC controls – Through the use of room occupancy sensor and CO2 controls, the each individual space can have the space set point temperatures setback as well as outdoor air levels reduced during unoccupied times to save energy. High performance glazing – Exterior glazing systems were designed as glazed in place systems which allowed them to reach high thermal performance values while still allowing ample amounts of daylight penetration and occupant views. Daylight harvesting – The strategically designed glazing along with daylight harvesting controls in exterior spaces maximize the amount of time occupants can use natural light while decreasing the load on building energy usage. High efficiency HVAC system design – High efficiency condensing boilers and air cooled chillers provide hot and chilled water to the HVAC air side systems which have decreased fan power through high performance system design. Improved thermal envelope – Increased amounts of insulation have been added to the building envelope in order to reduce unwanted heat loss/gain which in effect decreases the thermal load of the building HVAC systems. Low wattage LED lighting design – LED light fixtures along with efficient lighting layout design achieves desired interior lighting levels while using minimal lighting power. The Academic Innovation Center was delivered on schedule and at a cost of $1 million under budget. To accomplish this, Bryant University employed a combination of strategies to estimate and manage costs. Preconstruction CM services included detailed cost estimating and value management alternatives at design milestones. Also, a third party estimate and independent conflict detection and resolution review helped to predict and control construction costs. The project delivery method was Construction Manager at Risk. The contract type was cost plus fee with a Guaranteed Maximum Price. 470 Atlantic Ave., 7th Fl. Food Service/Kitchen Consultant: Crabtree McGrath Associates, Inc.